‘Does not a Vegan want to eat the same delicious food, do they not get bored with the same tasteless old recipes, get sick with the same meat substitute, get healed by the same medicine that is food, and warm up in summer and cool off in winter just like a non-Vegan? If you offer a breakfast burrito, do they not salivate? If you tempt them, do they not consider the temptation? If you accidentally give them meat and dairy, do they not get sick? And if you ignore them, will they not eat the same unimaginative tofu scramble?’ My husband replied “steady on there Shylock, it’s just wind from all the cabbage they eat”. But that’s his misunderstanding. I love food. No matter what your dietary preference is and what reasons you have for it, you should eat something tasty as well as nourishing. I may not practice veganism but I happily devour these burritos until it hurts and after 4 burritos it does hurt. They are hearty, spicy, delicious and may make you rethink your normal breakfast routine. 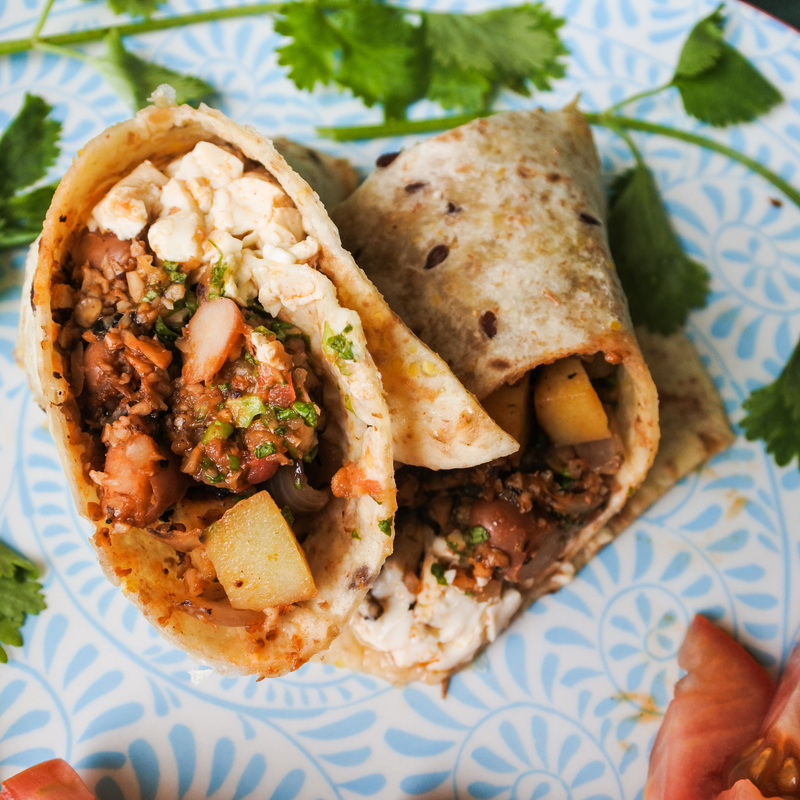 A tortilla wrapped around beans, mushrooms, salsa, and a smoky paprika tofu scramble? I’ll have that for breakfast, please! Dice potato and onion into small pieces. Add 1-2 tbsp of vegetable oil in a non-stick frying pan and cook on medium high heat. When oil is hot, add the diced potato and onion. Season with salt and pepper and cook until golden brown and soft. If you are having difficulty in softening the potatoes, add 1-2 oz of water to the frying pan and cook until water has evaporated and potatoes begin to brown. Clean mushrooms and cut into large chunks. Add to a food processor and pulse until mushrooms are in finely minced. In another skillet or frying pan, add 1-2 tbsp oil and heat on medium-high. Add minced mushrooms, tomato puree, bbq seasoning, cumin, salt and pepper and stir to combine then add the chopped green chile. Fry together until mixture has noticeably browned and mixture is no longer soft and a bit chewy. When browned and chewy, turn heat down to medium/medium low, add beans and toss together until properly combined. Cook for 4-5 minutes until beans are hot and seasoned from the spice mixture. Remove silken tofu from packaging and place in a colander. Sprinkle with salt and let the water drain from it as much as you can. Heat 1 tbsp vegetable oil on high heat in a non-stick frying pan. When oil is hot, add the tofu along with a dash of smoked paprika and stir. The more you stir, the more likely the tofu will fall apart so don’t feel obligated to break it into piece ahead of time. Cook for 2-3 minutes until mixture has heated through and resembles scrambled eggs. Heat tortillas in the oven until they are warm, soft and malleable. Add a large spoonful of tofu followed by 1 large spoonful each of filling and hash. Top with salsa, avocado, hot sauce, vegan cheese or whatever else makes you happy. Enjoy! Thanks. First time I made it, I ate 4 burritos in a row. Not my proudest moment but I definitely enjoyed them.